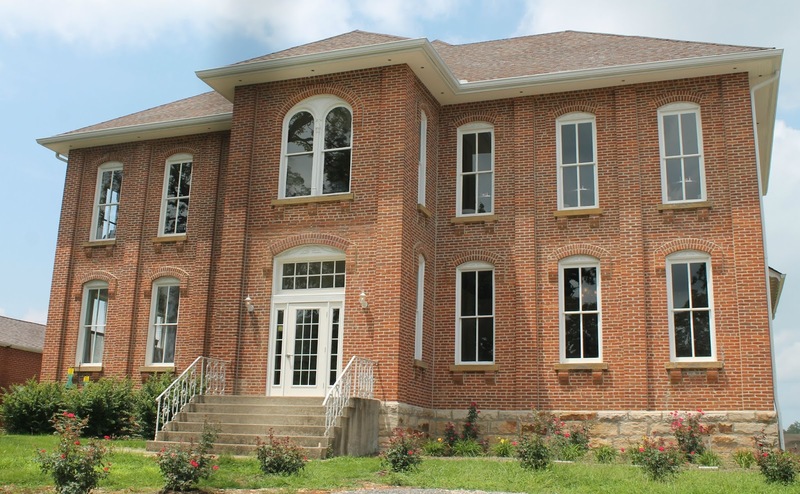 Probably one of the most exciting things to happen to Marble Hill, Missouri this past year is the opening of The Mayfield Cultural Center - the former Will Mayfield College. As long as I can remember this beautiful historic building sat empty overlooking the town of Marble Hill - sad, but true! Well after months/years of labor work and efforts of locals and enthusiast - the Mayfield Cultural Center is now open - not as a college, but as something for everyone in the community. The center recently hosted a quilt show of local quilters, it is available to rent for weddings and such, and.....they opened their cafe this week! Well today, with my 7 year old in tow, I ventured up to The Mayfield Cultural Center to have lunch - and my excitement for this place to be open has now doubled. Talk about class, fine dining, but still a hometown atmosphere - they have it. I felt comfortable eating their with D-man (my messy little boy), but I also felt like I had removed myself from one atmosphere and stepped into the finer way of life. D-man enjoying his BBQ Chicken Sandwich and Chips! The cafe is perfect for all occasions - noon lunch with friends, family dinner, and for you romancers - this could even take an afternoon date! My lunch! Tuna and Chips. If you ask me - you must try the tomato salad - I could have made that my entire lunch! Yum! The Mayfield Cultural Center is located at 209 Mayfield Drive, Marble Hill, Missouri - right beside the Bollinger County Natural History Museum, visit their Facebook page for current business hours and events. Bollinger County Natural History Museum - next door to The Mayfield Cultural Center - full of history and dinosaur facts! Whippoorwill Lake - Family camping, swimming, and much more! Great atmosphere! We highly suggesting stopping by. The Mustard Seed Boutique - located just down the street from the Bollinger County Natural History Museum - they are loaded gifts and they serve a pretty good lunch for a really good price. Holly's - Where to Find your Wear - shop until you drop at Holly's upscale consignment shop - one of our favorite stops in town!